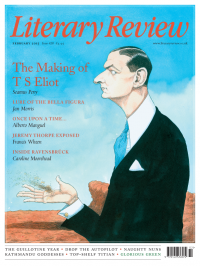 Biographers of T S Eliot face a number of challenges, not least the marked disinclination of their subject to having his biography written at all. When, in the early 1960s, a scholar wrote an account relating the poetry to his early life, Eliot went through the typescript striking out unwarranted speculations. ‘This is just silly’, he wrote in the margin at one point, responding to the perfectly mild suggestion that an interest in Arthurian myth might have been partly prompted by the paintings in Boston Public Library. His manner with admirers’ enquiries was celebrated for its unforthcoming deadpan: he was a master of disavowal and deflection. The comparison with Joyce, always happy to expand upon the ambitions and strategies of his genius for the edification of generations to come, is very striking. ‘Possum’, Ezra Pound’s nickname for Eliot, referred to an animal that played dead to deflect predators. One manifestation of the Possum spirit was Eliot’s destruction of much of his correspondence, so as to spoil the chances of his hunters. Robert Crawford’s adept and widely informed account of Eliot’s life up to the publication of The Waste Land in 1922 is committed to making such things seem to matter, and on the whole he succeeds very well. Eliot famously wrote that ‘the more perfect the artist, the more completely separate in him will be the man who suffers and the mind which creates’, but Crawford is not being unreasonable in seeking to reunite those separated selves, rooting out the raw materials that went into Eliot’s compelling and enigmatic poem. Eliot himself might be seen occasionally giving him some modest encouragement. Eliot certainly complained about ‘having my personal biography reconstructed from passages which I got out of books, or which I invented out of nothing because they sounded well’, but he also lamented an opposing indignity – ‘having my biography invariably ignored in what I did write from personal experience’, which implies that at least some of his verse had roots in a life that might usefully not go ‘ignored’. For Crawford, as for many of Eliot’s critics and biographers, the ‘experience’ that most matters in the run-up to The Waste Land is Eliot’s catastrophic marriage to Vivienne Haigh-Wood, a vivacious and gifted person whose needy anxiety and nervous illness tessellated in a disastrous way with his own intense reticence and emotional fragility. Crawford writes about Vivienne with sympathy and tact, while making it clear that she made her husband’s life as hellish as she made her own. She is not the cruelly abused victim portrayed in Carole Seymour-Jones’s deeply tendentious Painted Shadow, in which Eliot comes across as a conniving and duplicitous monster; but Crawford evokes very well the ways in which she was surely destroyed by the marriage, the misery of which lay largely in the clear-eyed guilt the Eliots both felt at the damage they were doing to one another. Crawford has been able to draw on a vast amount of scholarship and he has been assiduous in chasing down Eliot’s papers and annotated books across the world. He draws on many recollections of the poet’s circle: his major coup here is to be able to quote from a memoir by Eliot’s Bloomsbury friend Mary Hutchinson, though the figure who emerges from her pages, emotionally reticent and encumbered with ‘ignorance and hesitation’, is not unfamiliar. He is less interested in Eliot’s religious sensibility than Lyndall Gordon was in Eliot’s Early Years (1977), but he is a reliable and succinct guide to the many intellectual influences that shaped the young man: his readings and the subjects of his protracted studies are dealt with in turn as Crawford describes a heroic progress through literature and philosophy that left him more ‘thoroughly and strenuously educated’ than any other 20th-century poet. Crawford refers at one point to ‘teleologically-minded readers’ sniffing out future literary developments in disconnected early experiences; but the genre is naturally disposed to making all experience proleptic and Crawford generally treads carefully. That Eliot’s ‘aesthetic may owe something to his philosophical training’ is a point well made; whether the weeping typist Eliot met in Lloyds Bank has much to do with ‘the most famous typist in English literature’, in The Waste Land, is admittedly less ponderable. Amid all this hard-won learning, Crawford perhaps underplays the significance of the philosopher F H Bradley, on whom Eliot wrote his doctoral thesis. I don’t think Peter Ackroyd was exaggerating hugely when he claimed that ‘in order to understand Eliot’s prose writings it is also necessary to understand Bradley’, though the Stygian obscurities of Bradley do not make it a very winning piece of advice, to be sure. Still, Eliot long continued to think of himself as a Bradleian, and not just because no one ever really gets over the person they write their thesis about: both stylistically and emotionally, he warmed to the continence and vehemence that mark Bradley’s most characteristic writings, the idiosyncratic mixture of satirically crisp wit and a mystical feeling no less palpable for proving so elusive. Eliot’s metaphysical interests were ‘perfectly genuine’, as he once said of Coleridge, and ‘like most metaphysical interest, an affair of his emotions’.